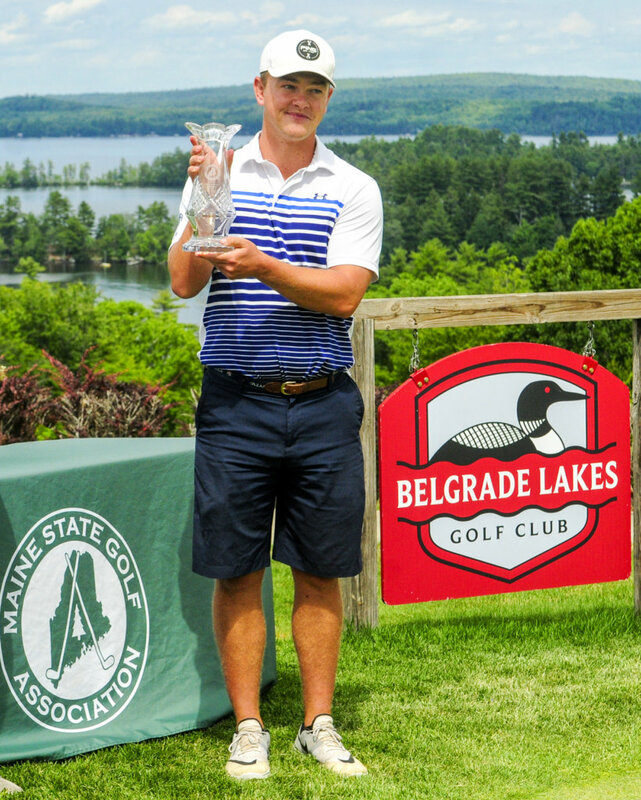 BELGRADE — For two days, Belgrade Lakes Golf Club’s seventh hole had been defending champion Jack Wyman’s personal bugaboo at the 99th Maine State Golf Association Amateur Championship. In Thursday’s final round, the same hole turned the tournament decidedly in Wyman’s favor. Wyman rolled in a challenging putt for par on the hole where he had been 3-over in the two previous rounds. Meanwhile, his closest pursuer, 17-year-old Cole Anderson, hiccuped his way to a four-putt triple bogey on No. 7. Anderson’s back-nine surge made it a race to the finish, but that three-shot swing paved the way for Wyman’s one-stroke victory. Wyman, 27, of South Freeport, finished the day with an even-par 71 to finish at 6-under 207 in winning the tournament for a second consecutive year. Anderson trailed by as many as six strokes after a bogey on the 10th hole before rallying with birdies on the 12th, 14th, 15th, and 16th to finish second at 5-under, also even par on the round. Anderson’s troubles on the seventh hole began when his second shot flew over the green, leaving too little room to hole a downhill chip. “It was sitting up in the rough a little bit, so we thought it might fly a little bit, but we had 163 (yards) to the flag and I was like, ‘There’s no way this carries 163.’ And it carried 185,” said Anderson, a three-time Class A high school champion who will be a senior this fall at Camden Hills Regional High. At the short par-4 15th, Anderson nearly chipped in for eagle and tapped in for a birdie. To that point, Wyman had played with an outer cool, methodically making pars to maintain a lead that seemed insurmountable. But Wyman’s own birdie bid from six feet slid by and he let a rare audible exclamation of disgust and slapped his thigh. “Cole, he was just on a tear so I kind of felt like if I had made that it would have slowed him down a bit and lengthened my lead to a point where it would be undoable,” Wyman said. Anderson bombed an iron 240 yards to pin-high on his second shot at the par-5 16th, but his eagle bid to cut the lead to one with two holes to play missed by an inch. On the 18th green, still down two shots, Anderson’s 10-foot birdie bid nipped the cup and stayed out. If it had dropped, Wyman would have needed to make an uphill seven-footer for par to preserve the win after rolling his birdie putt uncharacteristically long. Instead, Wyman played it smartly safe and lagged it up short for tap-in three-put bogey — his only bogey of the round — for the victory. 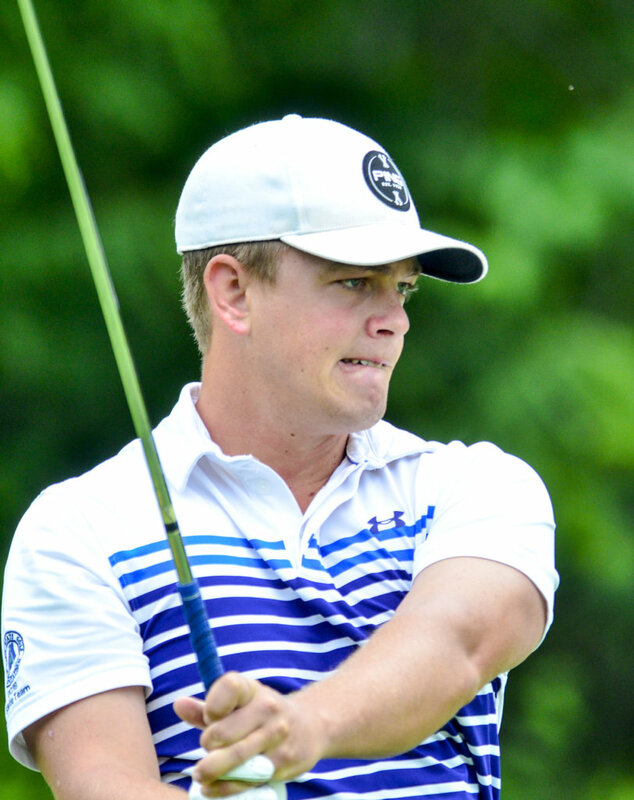 Wyman, who spent the winter in Charleston, South Carolina, to hone his game while working as a golf course laborer, becomes the first back-to-back winner at the Maine Amateur since Ryan Gay in 2010 and 2011. Next year’s 100th state am will be played at Wyman’s home course, Portland Country Club in Falmouth. “It was good validation for all the hard work I’ve done,” said Wyman, who will play next week in the New England Amateur at Portland CC. 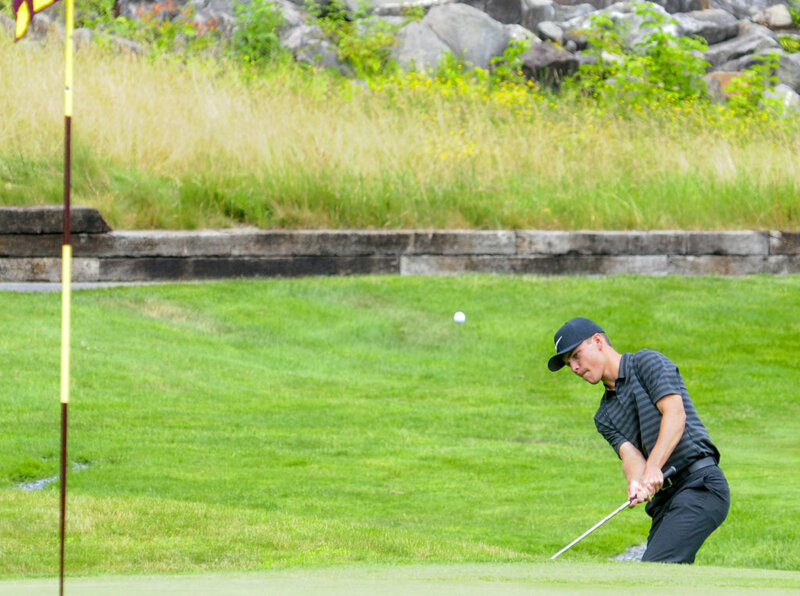 Anderson was trying to become the first junior player (18-and-under) to win Maine’s state championship since Seth Sweet in 2012. 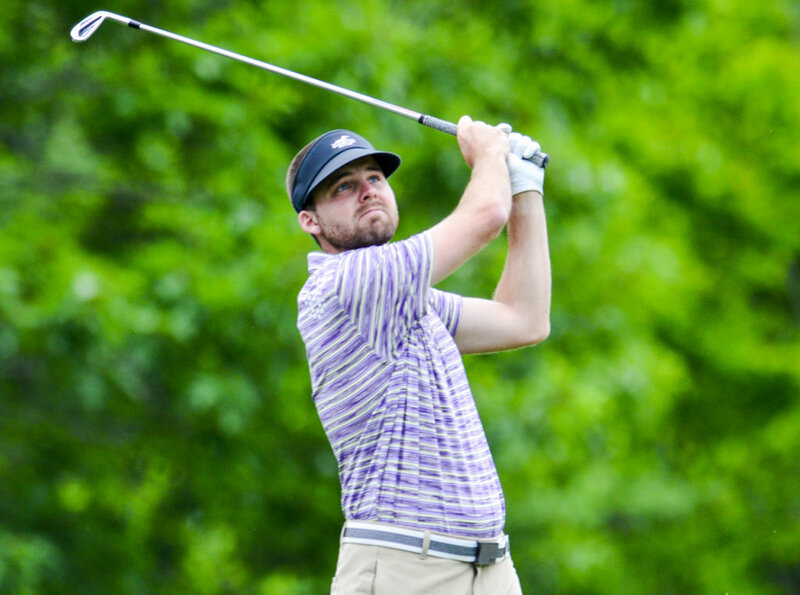 Early in Thursday’s round, John Hayes IV, the 2015 champion from Portland (Sable Oaks Golf Club) put on a surge. Playing in the next-to-last group, Hayes, 28, birdied the first three holes to tie Wyman at 6-under. Hayes took a brief lead with a birdie on the sixth hole. Wyman followed with a birdie of his own to tie it at 7-under — while Anderson was scoring eagle to pull within a shot. Hayes started to move backward with a bogey on the seventh — there’s that hole again — and fell out of contention when a combination of wayward tee shots and an inability to get up-and-down on chips near the green led to four straight bogeys to start the back nine. Hayes recovered to finish third at 4-under and was the only player to play all three rounds under par and the only player under par in the final round. Drew Powell, 20, of Holden (Penobscot Valley CC) finished fourth at 2-under after a final round 2-over 73. Playing in the final group, Powell had several birdie bids slide past the hole on a day where the course played longer and hole placements were trickier than in the first two rounds. Caleb Manuel, 16, of Topsham (Brunswick GC) was fifth at even par. Manuel will be a junior this fall at Mt. Ararat High. A trio of Martindale members finished in the top 10. Andrew Slattery was sixth, at 2-over, while Joe Baker was seventh (4-over) and Craig Chapman ninth (7-over).